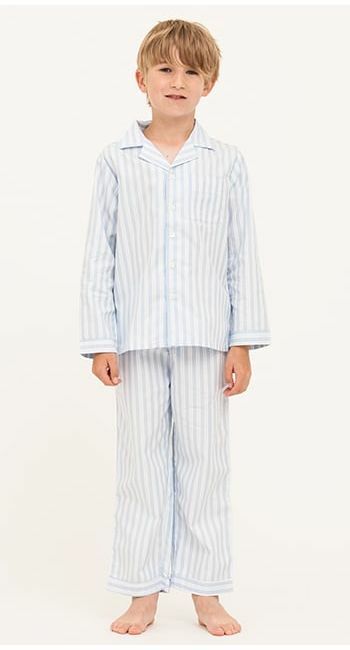 A stylish nightshirt in a fresh blue and white stripe. Available in two lengths. Matching ladies pyjamas and boys pyjamas available. (Matching shorts available in size S - please call if you'd like to order these). 88cm/100cm measured down centre back from base of collar to hem. (Model height 5'8", UK 8 - wearing size S). Our nightshirts do come up slightly smaller than our pyjamas so we suggest going up a size. Light the fire and lose yourself in the sunday papers. If you love your classic striped nightshirts, this is the one for you.